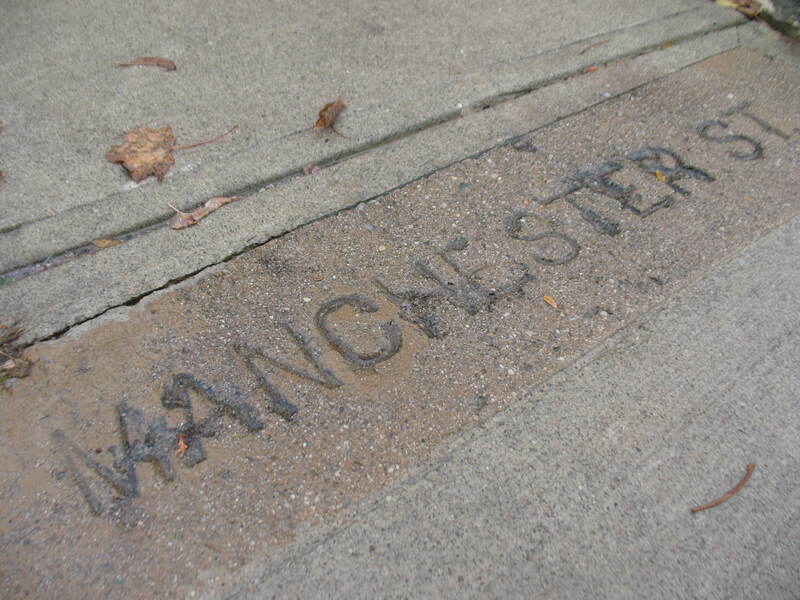 Pavement stone memorial to Manchester Street. Fleet, Manchester, Devonshire…what do these names have in common? They’re the former names of Yorkshire, Glasgow and Dublin Streets, south of Waterloo Avenue. But Waterloo wasn’t Waterloo, it was called Market Street back in the days when an electric street railway ran down its centre. Waterloo was in use elsewhere as the former name of what is now Fountain Street. 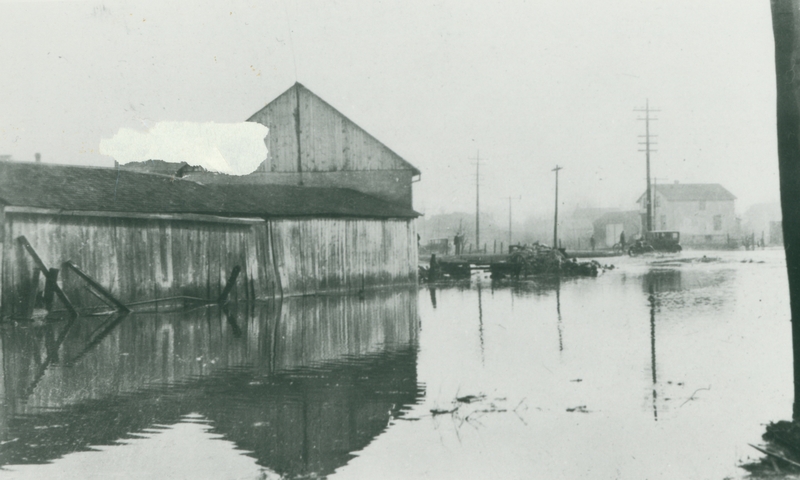 1929 spring flood, corner of Manchester and Bedford. The south of Waterloo neighbourhood has undergone many name changes…the current Bristol Street formerly had three titles, going by either Bedford, Bristol and Webster, in its various segments along the river’s flood plain. Looking at old maps and atlases of Guelph can be disorienting, as these old street names have changed over time, some streets have disappeared, even the Speed River appears to have altered course (with a little help). Ross Irwin’s book, Guelph, Origin of Street Names, 1827-2008, meticulously documents the history of Guelph’s streets. It’s fascinating to learn that Guelph once had two Bridge Streets and three John Streets. It must have been challenging to give directions back in those days. 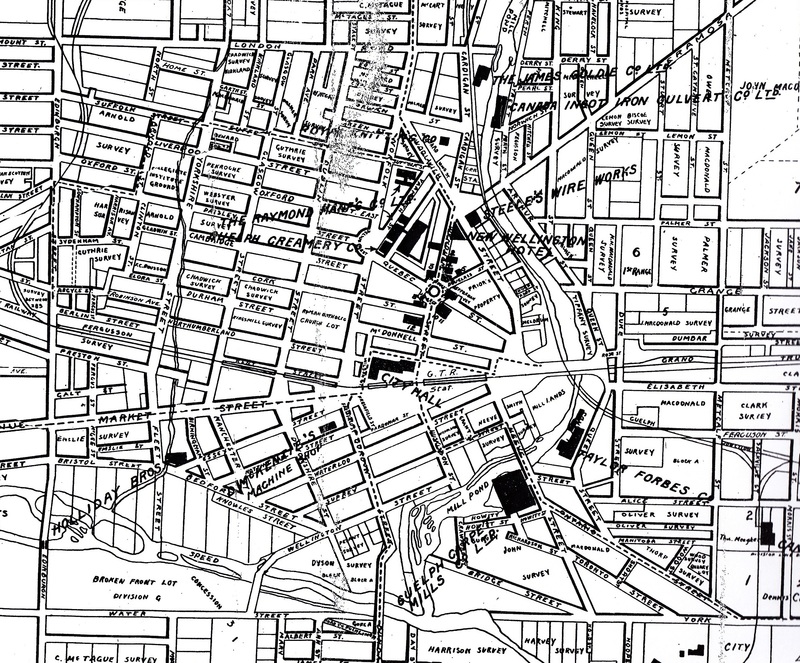 Old Guelph street map 1915. Some street name changes make sense to me, as duplication of names could only lead to confusion. And changing Fleet, Manchester and Devonshire to Yorkshire, Glasgow and Dublin Streets South maintained consistency and flow with their counterparts north of Waterloo Avenue. According to Mr. Irwin’s book, many street name changes occurred in 1956, when duplicated names were eliminated, and name consistency was applied to many streets’ entire length. Some names abandoned at this time resurfaced later…such as Argyle which re-appeared as the name for a street in a new subdivision west of the Hanlon Expressway in the late 1960s. Some street names live on only in old maps…or in a sidewalk stone…embedded in concrete at the corner of Dublin St. S. and Essex St., as a memento of days gone by.